Remember when we used to play video games in cartridges? Although it sure looks nice to play with retro games once in a while, finding a working console is like finding a needle in a haystack. But why waste money on looking for one when you can buy a new console that cater to your retro gaming needs? 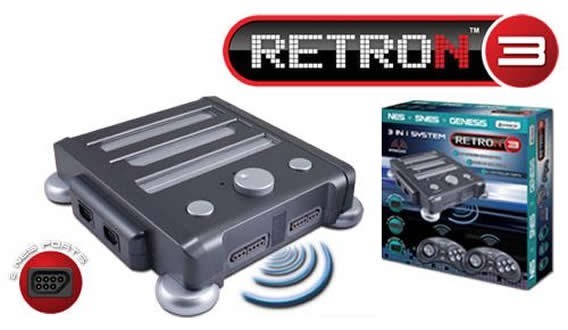 The RetroN 3 Video Gaming System can play the old games from Nintendo, Super Nintendo, and Sega Genesis. Yes, three nostalgic consoles in one piece. It features three cartridge slots and two controller ports for each platform (enabling users to play with old controllers), and two wireless controllers. Simply connect the system with either S-video or composite and you are set. The RetroN 3 is now available online for only US$69.99, available in red and gray. Now if only someone could do the same concept on PlayStation 1, Dreamcast, and Xbox.